The adventures of two expat cats and their staff. After living in Ireland for nearly three years, it’s time to move on again. This time, we’re going to Abu Dhabi. We’re not strangers to the Middle East. We lived in Doha, Qatar, for four and a half years before moving to Ireland. Every time we’ve moved in the past, I have failed to document the process. This time I’m getting a head start on writing about moving and adjusting to life in a new country. I will also write about my knitting, drawing and other art and craft projects. I might even review some books and films, you never know. The packing and sorting is underway. We’ve lived in five different homes since 2008, so we really should have this packing thing down. Petal, Omar and Cave when they were getting along. Sadly, only two of our three cats are coming with us. We adopted Cave a year ago. He’s a gorgeous little bloke. He loves us and he loves Petal and Omar. They, on the other hand, do not love him. We did the introduction process slowly and carefully as all the cat advice books told us to. There was a five-month honeymoon period during which they shared the sofa, ate next to each other and generally rubbed along fine. 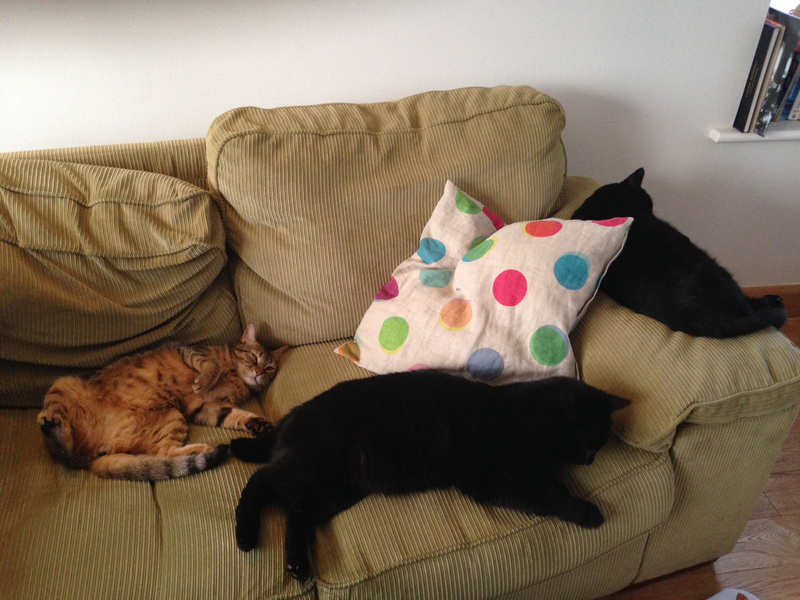 But after we took them all to the vet one day, Petal and Omar decided they no longer liked Cave. Omar started chasing him and blocking access to the food bowls and litter trays. Petal can’t bear even to look at him, and swipes whenever he comes near. When my mum came over to visit, she fell in love with Cave. I think this was because he sat on her lap and gazed adoringly into her eyes, whereas the other two have consistently ignored her throughout their acquaintance. As soon as she heard we might be moving, Mum said, ‘Are you taking Cave? I’ll have him!’ so that was that. It’s been many years since she had a cat of her own and I think she’s quite excited.